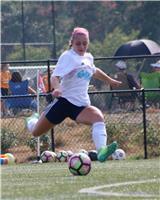 I have had a profile on SINC Soccer for 4 years, and it helped me to organize my information so that I was ready when the recruiting process started. I had selected some schools using your site when I was 13 and that helped to start the conversation with those schools and find out about their ID camps, and when UNC made an offer I was prepared. - Maggie PierceWhat are others saying?